The Tasks tab on the Dashboard shows a list of provisioning tasks that Connect has to complete, such as setting up call forwarding, or inviting a new user. The status of tasks appears on the right hand side. Status can be ‘Pending’ or ‘In progress’, by clicking the More button you can chose to refine the list to show only tasks with one of these statuses. Clicking on a task shows ‘Task Details’. This gives further details of the task, and any action taken in case of an error in the system. Clicking the Show completed tasks link takes you to the ‘Competed Tasks’ page, where a table of past tasks is shown. If searching for a specific task ‘Month’ and ‘Year’ can be selected at the top. Use the arrows at the bottom right to browse the list. Clicking Show Uncompleted Tasks takes you to the ‘Task List’ page. This shows uncompleted tasks in table format. To view a task, click on it in the table and then click View Task at the top. This gives the same details that can be found when selecting tasks directly from the dashboard. Date/Time: This is the time and date the case was raised. Task ID: The number used by essensys support staff to identify the case. Client: This is the person who set the task. Description: A brief description about the nature of the issue. Created by: Email of the person who raised the case. Status: This is how far along Connect is in the process of the task and can be ‘pending’ or ‘incomplete’. 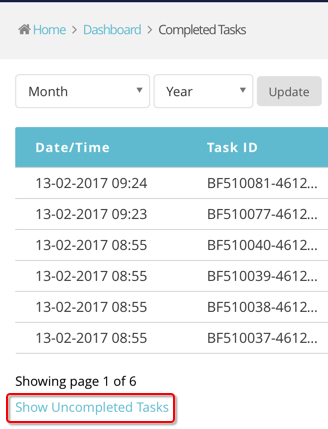 ‘Completed tasks’ also shows the date and time (Completed Date) at which tasks were completed.